Apologies for the hiatus. So much has been going on Allison's, Jodi's and my life since I last posted, and we'll be posting more about that later. In this trailer: Photo stills courtesy Phil Mills, John Hall, Walter Korynkiewicz. Allison will be posting more in her Livejournal, but here's my personal perspective on the honour. We have printed 100 copies. 25 are already spoken for, going to our contributors and our own copies, but we'll have 75 for sale at FilKONtario this weekend. Our joint launch party with Talis Kimberly, who is debuting her Duckon concert CD, will be in the con suite at 11:15 pm on Friday. John, Allison, Jodi and I worked very hard on this project, which has been in progress for about a year. Mega thanks to the brilliant Mark Bernstein, who did the narration. 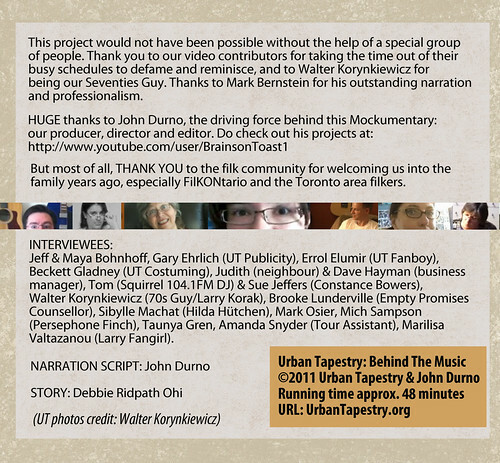 Huge thanks also to John Durno, who was our producer, director and editor. 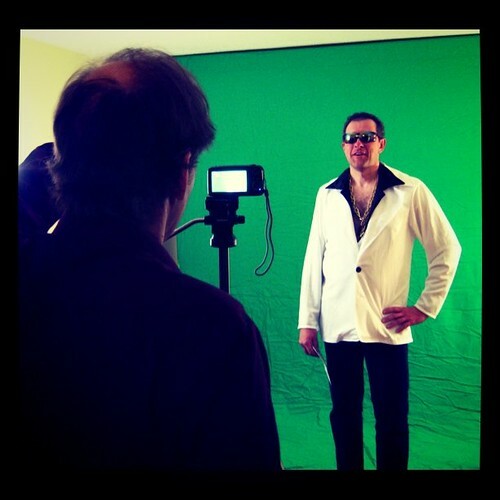 Do check out John's other video projects and "Like" his page at B.O.T. (Brains On Toast Productions) and visit the Brains On Toast YouTube Channel. Sibylle Machat as Hilda Hütchen. Unfortunately Sib's name got mangled in the final credits of the Mockumentary-- humble apologies! I saw the whole thing for the first time last week, when Allison, Jodi, John and I got together, and was SO SOOOOOOO tickled at how wonderfully it turned out. Not only did Mark and the contributors do a fantastic job, but John did some brilliant work editing and putting the whole thing together. 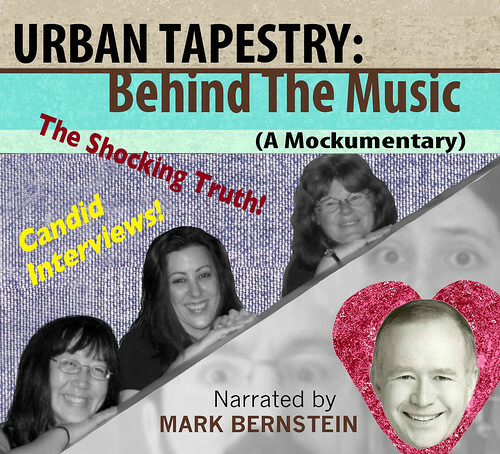 There are video clips of pseudo-interviews, photo stills and video clips from our very early days as Urban Tapestry (as far back as 1994) and through the years up to the present. 1. 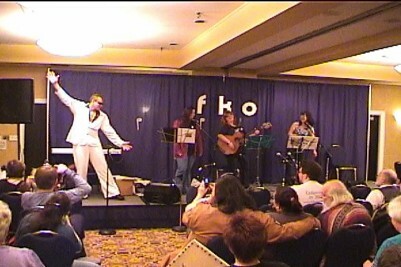 Our performance of The Seventies Song in 2008 at FKO, with Walter Korynkiewicz as The Seventies Guy. Video courtesy Walter. 2. Our performance of The Neurotic Love Song in 2009 at FKO, with Walter as Jean-Luc. Each time we perform this, I always swear it's going to be THE LAST TIME. If you haven't ever seen us perform this song live, then watch this video to see why. Video courtesy Walter. 3. 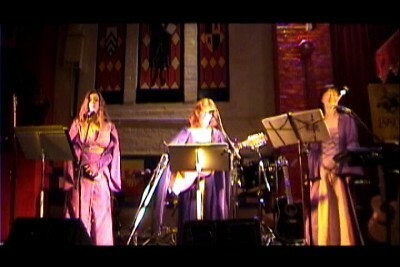 Our performance of The Question (a Lord of The Rings song) in 2003 when we performed it at a Tolkien convention at the Medieval Times. This song has NEVER BEFORE BEEN RECORDED. I especially like this video because the three of us are dressed up in our medieval costumes, and the backdrop is pretty cool. 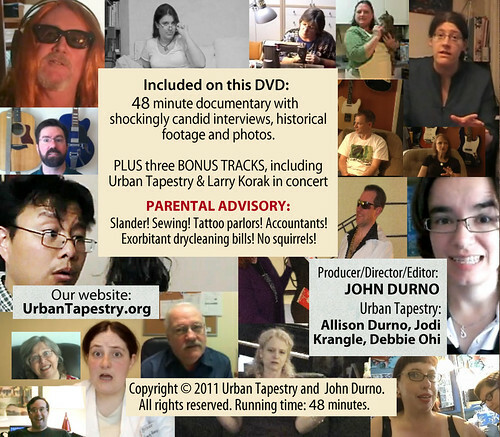 Filmed & edited by John Durno. 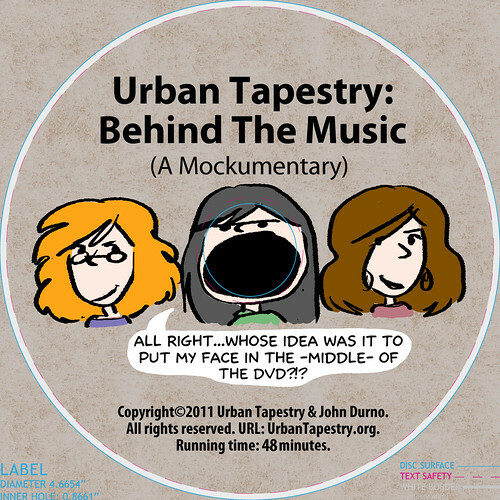 When I was watching the mockumentary for the first time, I was struck by how well John has integrated both our pseudo history and our real history as well as capturing the fun and friendship throughout. And whoa -- he pulled out some reeeeally old concert footage that I hadn't seen in a very long time. Anyway, please do consider buying this DVD. Price: Cdn $20. If any are left over after FilKONtario, we'll make some available once we figure out how much to charge for shipping & handling.